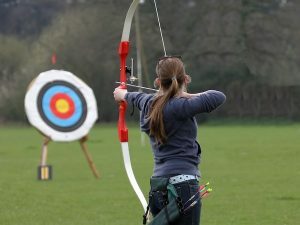 How is Archery Played at the Olympics? All sports evolve over the years with some ending up being quite different from what they were originally in the beginning. Some similar happened with archery and it should be noted that this is visible by the many changes that have already seen in this sport. One only hopes that as modern technology finds its way into the archery sport that it will not lessen its demand for precision and skills. Most likely, the changes will take place in the type and calibre of equipment that is used in this sport. In order for it to be true archery, it will always have to consist of some form of bow and arrow. The question will be how it affects the skill level of the sport. What is most likely going to create the biggest effect will be the materials that are used for the major components of the archery equipment. This will be the bow itself, the bowstring and the arrows. All of which are important components that the athletes in archery have to master in their uses. Another very important component is the arrows. These are what delivers the final results. Their design, materials, and weight are all mitigating factors. If any of these components are altered dramatically, it can have a huge impact on the sport of archery. A good example of this was the transitioning from wood arrows to the newer aluminium types. The reason why this new material was introduced is that they would be lighter in weight, making it easier for the archer to handle and increase the travel distance. For some who were set on the original materials of the bow and arrows, these changes were often not welcome. Part of the skill set that so many archers diligently work on and take great pride in is the mastering of the equipment as it is today. To change this to make it easier, for some, it is perceived as a big interference in this sport.